"Vision for the nation emanates from Parliament"
Honourable Members of Parliament, my greetings to all of you. It has been a great experience for me working with the members of Parliament during the last five years. I have addressed the Parliament ten times; I have had the benefit of interacting with you at individual and specialist’s group levels. I thank every one of you for your cooperation. During my period of presidency, two Governments have been in place and both the Prime Ministers Shri Atal Bihari Vajpayee and Dr. Manmohan Singh have had many meetings with me and I have had the fortune and benefit of their counsel. The Presiding Officers of Lok Sabha and Rajya Sabha have the important mission of catalysing the best performance of the parliament. I would like to congratulate the Speaker of the Lok Sabha, Shri Somnath Chatterjee for his efforts to create a high tech museum depicting the continuum of democratic heritage in India. Also his efforts in creating Loksabha TV for televising the proceedings are in line with the needs of the modern democracy. Our Former Vice President Bhairon Singh Shekhawat, a remarkable person with a wide canvass of experience, has received general appreciation from all about the way in which he conducted the Rajya Sabha proceedings. I also enjoyed working with him as a Vice President. I congratulate the President elect Smt. Pratibha Patil on this historic occasion and wish her all the best in her mission. 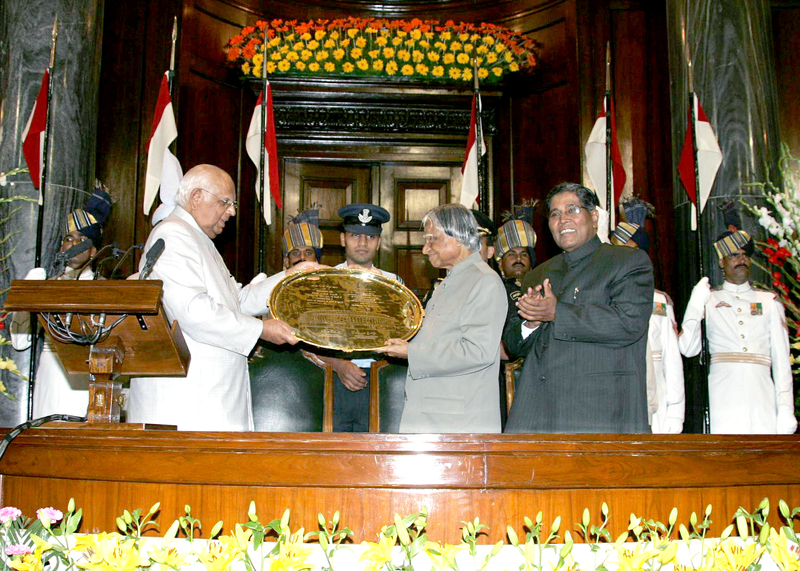 On this occasion, I would like to recollect with appreciation the contributions made by the past Presidents of India, each one bringing his own core competence to the Rashtrapati Bhavan. I would like to thank the Governors and Lt. Governors of all the States and Union Territories and the Chief Ministers of all the States for their co-operation, when I visited the States and Union Territories. Particularly, I would like to thank the Chief Ministers and the Presiding Officers of the Legislative Assemblies of fourteen states and union territories for facilitating me to share the vision for their States and the missions thereon. Dear Parliament members, I realize and appreciate how Parliamentary debates and decisions have led the nation today towards an ascending economic trajectory. Nation’s standing in the world is clearly visible. I have witnessed this special aspect during my visits to sixteen countries. As the President of India, I had the privilege to address various Parliaments abroad including the European Union Parliament. I am happy to note that the special respect for Indians during my interactions with many Heads of States and delegations visiting India. 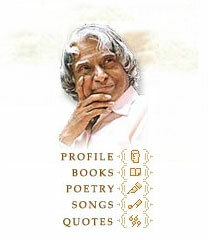 With this background, I visualize the following distinctive profile of India by the year 2020. 1. A Nation where the rural and urban divide has reduced to a thin line. 3. A Nation where agriculture, industry and service sector work together in symphony. 5. A Nation which is the best destination for the most talented scholars, scientists, and investors. 6. A Nation where the best of health care is available to all. 7. A Nation where the governance is responsive, transparent and corruption free. To achieve the distinctive profile of India, all of us have before us the mission of transforming India into a developed nation. In order to succeed in our mission, the key five areas where India has a core competence for integrated action are: (1) Agriculture and food processing (2) Education and Healthcare (3) Infrastructure: Reliable and Quality Electric power, Surface transport and Infrastructure for all parts of the country. (4) Information and Communication Technology (5) Self reliance in critical technologies. These five areas are closely inter-related and if progressed in a coordinated way, will lead to food, economic and national security. One of the major mission within these five areas is the development of infrastructure for bringing rural prosperity through Provision of Urban Amenities in Rural Areas (PURA) by creating three connectivities namely physical, electronic, knowledge leading to economic connectivity. The number of PURA clusters for the whole country is estimated to be 7000. Simultaneously, both from energy and environmental considerations, we should aim at achieving Energy Independence by 2030. Energy independence has got to be achieved through three different sources namely renewable energy (solar, wind and hydro power), electrical power from nuclear energy and bio-fuel for the transportation sector. Energy independence throws very important technological challenges to the country. While we are happy that our economy is in the ascent phase and our GDP is growing at nearly 9% per annum, it is evident that economic growth is not fully reflected in the quality of life of a large number of people, particularly in rural areas and even in urban areas. Hence, we have evolved what is called a “National Prosperity Index (NPI)” which is a summation of (a) annual growth rate of GDP; ¬ plus (b) improvement in quality of life of the people, particularly those living below the poverty line plus (c) the adoption of a value system derived from our civilizational heritage in every walk of life which is unique to India. That is NPI=a+b+c. Particularly, ‘b’ is a function of availability of housing, good water, nutrition, proper sanitation, quality education, quality healthcare and employment potential. ‘c’ is a function of promoting the joint family system, creation of a spirit of working together, leading a righteous way of life, removing social inequities, and above all promoting a conflict free, harmonious society. This will be indicated by peace in families and communities, reduction in corruption index, reduction in court cases, elimination of violence against children and women and communal tensions. There should be progressive reduction in the number of people living below the poverty line leading to its becoming near zero by 2020. All our efforts in improving the national economic performance should be guided by the measured National Prosperity Index of the nation at any point of time. How shall we realize this vision? What are the immediate steps that we need to take to realize this vision? (i)	To formulate an Energy Independence Bill - A three dimensional approach for energy choice towards realizing clean planet earth. (ii)	To adopt a resolution for Vision 2020: Adopt a Resolution that India will be transformed into a safe, prosperous, happy and socio-economically developed nation before the year 2020 using National Prosperity Index (NPI) as a measure. You will agree with me the importance of making these bills a reality in a time bound manner. I have narrated the profile of the nation by 2020 and the actions needed to achieve the missions. While we have made significant gains in our economic performance, our performance on a range of human development and governance indicators require significant improvement to achieve the status of a fully-developed nation. The future political leadership the world over has to rise to the challenge of sustainability of growth, development, environment and resources. Honourable Members, you have a major role to play in the creation of future leadership for the 21st century in creating missionary zeal among the youth of the nation to promote moral strength, security and prosperity for our people. At the dawn of 21st Century, Parliament, like any other institution, faces greater challenges than ever before, especially on matters related to human development and governance. India can be rightly proud of its leadership and its many achievements in economic, social, scientific and political fields over the past 60 years. But we cannot afford to rest content with the past achievements and we have to march in tune with the challenges of 21st century in technology, industry, agriculture, trade, governance system and leadership style. National leadership has to radiate confidence in our people that “we can do it”. The challenges in realizing the developed India vision 2020 provide also opportunities for innovation in every aspect of governance and legislative actions. As we review the governance system and legislative processes for the 21st century, full advantages and implications of technological revolutions, national and global connectivities, globalization and international cooperation and competition have to be taken into account. Honourable Members of Parliament may like to debate these suggestions and evolve, with unified and harmonious leadership, a Parliamentary Vision for the Nation, in the same manner as when our Constitution was first drawn up. 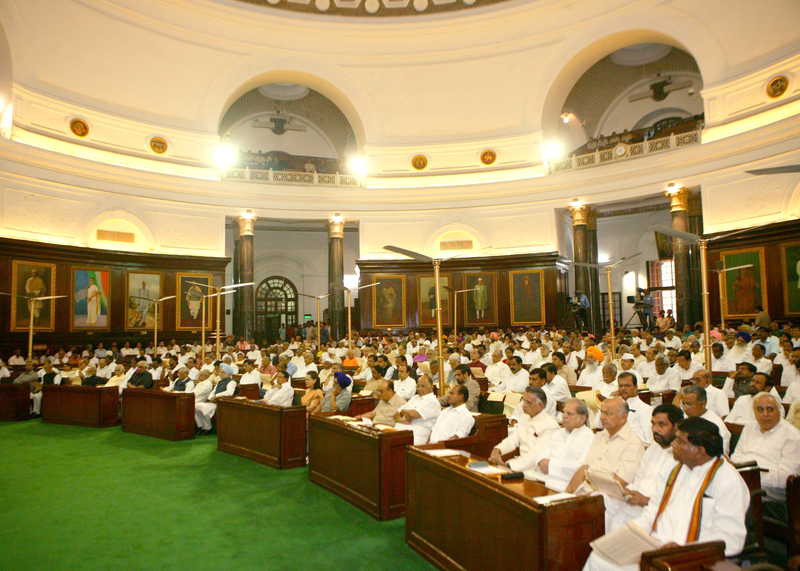 This 21st Century Parliamentary Vision for India needs to have a global and long term perspective, and needs to be underpinned with implementation strategies, integrated structures and action plans for transforming India into a developed country by 2020 with National Prosperity Index as a measure and acquire energy independence before 2030. It is this unique Parliamentary Vision and its effective implementation that would make our billion people smile and smile together. Working together in unity and harmony for a national Vision is the greatest need of the hour for our parliamentarians. You will agree with me that this is one of the most important mission of our Parliament today. 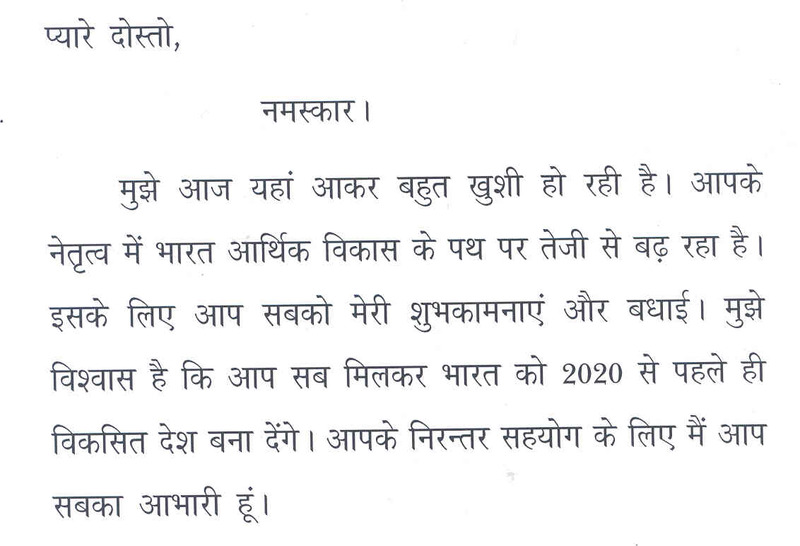 May I once again convey my gratitude to all the Honourable Members of Parliament and my best wishes to all of you in your mission of realizing the goals of developed India 2020.